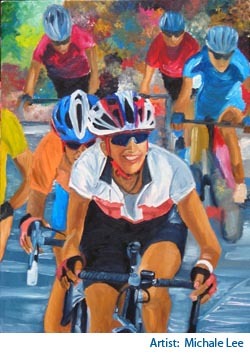 Bicycle and art aficionados will get their chance to view and bid on great bicycle art at the Kimberlee's Bikes for Kids Bike Art Bash. The art will be premiered in San Diego at a gala reception in early November then auctioned on eBay. All proceeds will benefit Kimberlee's Bikes for Kids, which distributes new bikes, helmets and locks to underprivileged 1st - 3rd graders. "Kimberlee loved bicycling and she loved art, so we're combing the two to raise money for Kimberlee's Bikes for Kids," says Dan Gindling, Kimberlee's husband and president of KBK. "In just a couple of days of solicitation we've already secured about a dozen outstanding works of bike art. The Bike Art Bash is going to be an exciting event." Much of the art will be one-of-a kind original pieces and will include paintings, sculpture and art created from found/recycled material. Also, auctioned will be bicycle prints, posters, and jewelry. The KBK Bike Art Bash will be heavily promoted throughout the bicycle industry. "We are calling for artists to help get kids on bikes by donating a piece of art to the auction," says Gindling. "Their donation will not only help put smiles on children's faces, but because KBK is a 501c3 non-profit foundation the selling price of the art will be tax deductable to the artists." The KBK Bike Art Bash gala reception date and venue is still being planned. The deadline for receiving art is September 15th. For those artists wishing to donate to the Kimberlee's Bikes for Kids Bike Art Bash, please e-mail dan@kimsikes.org, or call (619) 692-1313. Established to honor Kimberlee Caledonia, a talented and avid cyclist from San Diego who died of brain cancer in 2008, Kimberlee's Bikes for Kids distributes free bicycles, helmets and locks to underprivileged 1st - 3rd graders. In 2010 the foundation will distribute bikes, helmets and locks to children in San Diego, Lousiville, Indianapolis and Boston. For more information on the 501(c)(3) foundation, go to www.kimsbikes.org.